So the Warriors are still flakey as and McFadden doesn't trust Tui Lolohea in the wet... and we had the chance to go back to Manly with our tip after seeing the conditions and didn't. Our hand goes up - mistake. But we will all take 5/6 right? 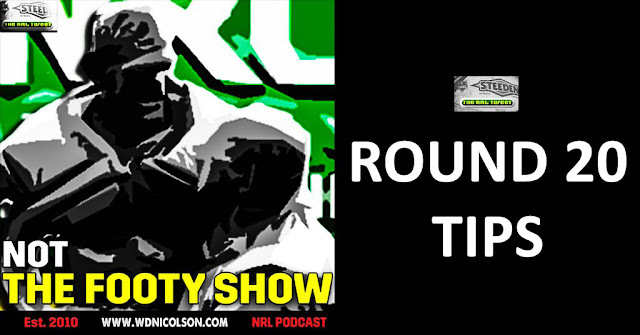 Round 20 Tipping Skinny: .Tough week ahead - Cows-Dogs isn't that clear cut but go home team, Broncos should beat Penrith but no certainties, Raiders over Warriors at home will do, Titans have more to play for than Parra, Storm to hold off gallant Chooks, Sharks to account for Knights, Dragons-Tigers is a coin-flip as the Farah decision has me not rating the Tigers nearly as much in this one as I did a few hours ago and so is Monday - DCE v Reynolds decides this and I'm not sold either way.